Traveling Tuesdays is taking you on a trip to the Emerald Island. 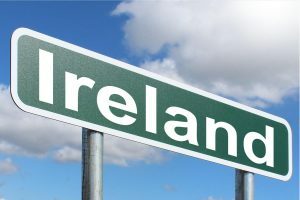 Today is the letter “I”, so we will take a brief stop in Ireland. Ireland brings back so many memories. 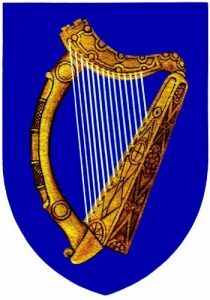 I had my first visit to Ireland in the summer of 1992. 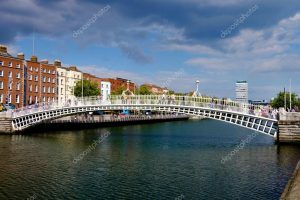 I traveled with a friend who had Irish roots in Northern Island and while we were staying with my sister in Dublin, Cookie and I traveled by train to Northern Island to search for relatives of her Mom in Belfast. After returning to Canada that summer to attend Alberta Camp Cherith as a staff member, I packed up again and returned to Dublin to spend a year with my sister in Dublin. I had taken a year leave of absence from work to go and live with my sister at one of her posts with the Canadian Foreign Service. The original plan, a year earlier, was that I would go to Ruth’s next post and teach at an international school. So long story short, I spent a year in Ireland with my sister. We lived in Dublin 4 and Ruth worked at the Canadian Embassy and her office window looked over St. Stephen’s Green. I enjoyed a year off and discovered what it was like to have the Freedom to do what I wanted to do whenever I wanted. I could live Life on my own terms. 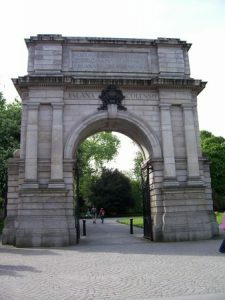 Here is the entrance to St. Stephen’s Green approaching the park from a shopping trip. We would often walk through the park. The Canadian Embassy was in a building located at the corner diagonally opposite this Arch. Walking through this beautiful park was such a restful place after the hustle and bustle of downtown traffic and shopping. As I mentioned in the beginning, I could plan my day and do pretty much what I wanted while Ruth had to get up and go to work. So I did a lot of exploring. I was able to join the International Women’s Club and I joined them on excursions all over the city. We toured many interesting buildings and historical sites. I was able to be a part of the IWC Choir and we met and sang Christmas Carols from all over the world to share at different functions at Christmas time. I needed transportation so early on I bought myself a bicycle and equipped with saddle bags I was able to tour lots of the city on my bicycle. There was a Ladies’ Badminton Group on Tuesdays that met at the church I attended and I was able to bike over each week and join in a doubles match or two and then we would stop and have tea. One can visit and see so much more on foot or on bicycle than you can while traveling by car. The Bicycle shop was down near the Ha’penny Bridge shown here. 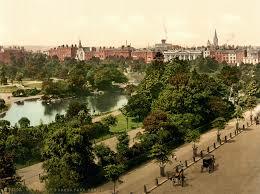 On the right is Phoenix Park in Dublin. One excursion I took by myself, was a four day/three nights 150 Km bike trip. 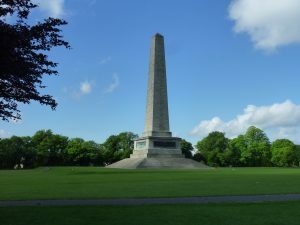 I left Dublin 4 and proceeded to Phoenix Park and did a self planned trip out and around Dublin. I planned it so that I would do approximately 50 Km each day and I had booked a B&B ahead of time so I could check in at my accommodation, have a rest, and then explore that particular village in the evening. Then up and off again the next day to my next B&B. It was a physical challenge but lots of fun and I just enjoyed touring around and seeing the countryside. This was ahead of cell phones and text messages so I could only check in each day with a brief phone call to my sister to say I had reached my destination! When Ruth had a few days off from her J.O.B. 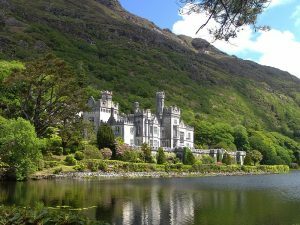 we would head out of town and take a car trip to many gorgeous spots in Ireland. There is so much to see and do in the beautiful country that I am finding it hard to share a particular one. 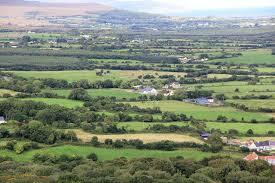 I will add some photos and let you see a few of my favorite views of the Emerald Isle. 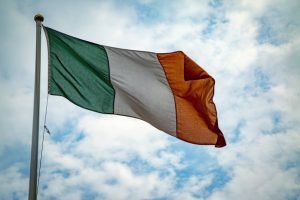 The Republic of Ireland is in green. 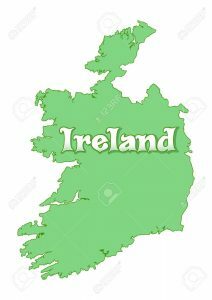 The top white bit is Northern Ireland and is part of the UK. My ancestors were from Scotland and they left from Londonderry in Northern Ireland to cross the Atlantic and settle in Nova Scotia. While spending my year in Ireland with Ruth, we were able to arrange a trip for our parents. We took the car on a ferry from Dublin to Wales and then drove to Heathrow to meet Mom and Dad. It was a great time showing Mom places in England she had never had the opportunity to visit – Windsor Castle, Trafalgar Square, Buckingham Palace, Big Ben, Kew Gardens, Canterbury, York and many more. We learned so much more of Dad’s experiences during WWII. He would say, I was here before or I saw this while serving in the RCAF (Royal Canadian Air Force). Dad was in radar helping to keep the bomber pilots safe during the war. We took Mom and Dad to Shelby to see where the airstrip was and Dad was delighted to find a monument built to commemorate his division. One of my favorite pictures is that of my Dad standing beside it and saluting as I snapped his picture. We drove into Scotland and showed them places belonging to the Grahams. We found the Graham Mansion and the Graham Castle! 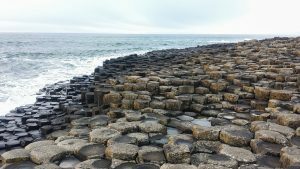 From Scotland we took a ferry to Belfast and while in Northern Ireland visited the Giant’s Causeway. After arriving in Dublin and a few days rest we were off again to see more of Ireland. The Cliffs of Moor was a favorite spot and again we have pictures of Mom & Dad enjoying a visit to so many places. This is Kilmore Castle and I revisited this spot on my most recent visit to Ireland. 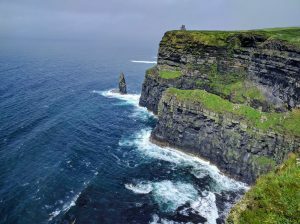 Ireland is a must do vacation spot. 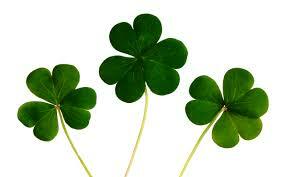 It is such a beautiful place and every St. Patrick’s Day everyone claims to be Irish. The people, the music and the country are so spectacular. Be sure and come back next week and catch some of my favorite spots in a country starting with the letter ‘J’.